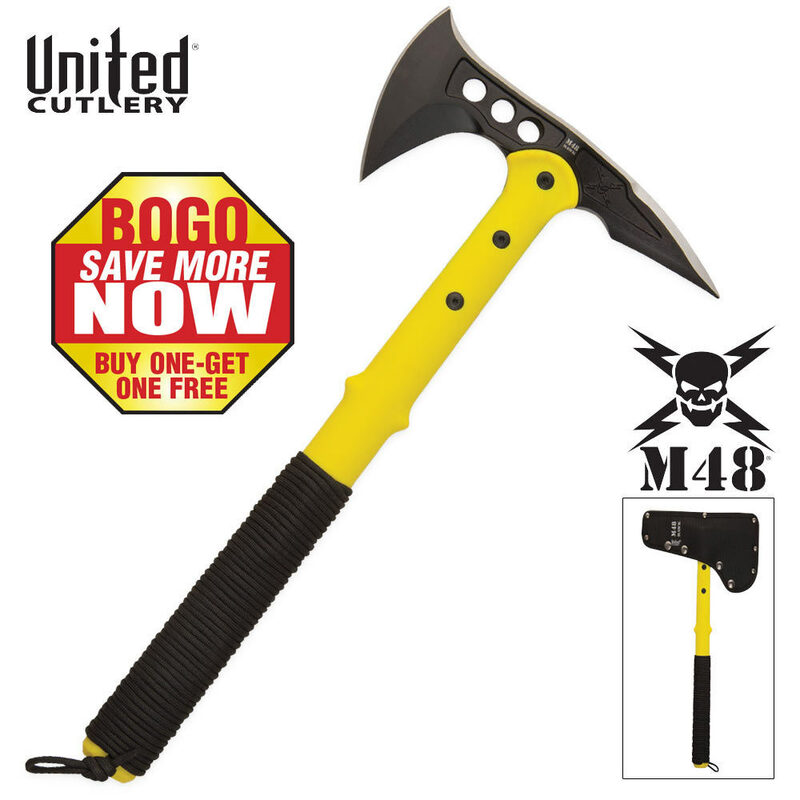 Survival Rescue edition of our Advanced Combat Tactical Tomahawk, with bright yellow handle and cord wrapping. This advanced fighting tomahawk may be the ultimate tactical weapon. It is lightweight enough to be carried all day without added muscle fatigue and the tough head offers a wide, upswept axe blade for mammoth chopping, slashing and cutting potential. The secondary edge on the backside of the head is specially sharpened on both sides for a cutting and hooking attack. When combined, the spike and axe head make for an efficient personal defense and breaching tool. The anodized AUS-6 stainless steel blade is securely attached to the virtually indestructible 30% Fiberglass reinforced nylon handle with three separate bolts. It comes complete with a nylon snap-button sheath. 8 in. blade, 15 in. Overall. "I've had this hawk for awhile now and it's very impressive. Great thrower and very durable." This is an amazing tomahawk, by far my favorite hawk out of my hawks that I own! I would recommend this to anyone looking for an awesome tactical hawk!! This is a great deal!Not just 1 great thower but 2.